Not sure if this is the right forum, or if I should be asking under the Mounts forum, but, since it's a classic mount, I posted here (Mods, please move it if necessary). Monday, I acquired a Star Finder EQ mount from a local antique/trading store. It's the early AC powered version, with 1" shafts. I bought it for 20 bucks, thinking, if it doesn't work, I could part it out, and keep the pier for any number of projects. Well, long story short, it works, but, had been left outside in the elements. It's in good mechanical condition, aside from the rusty declination/counter weight shaft. 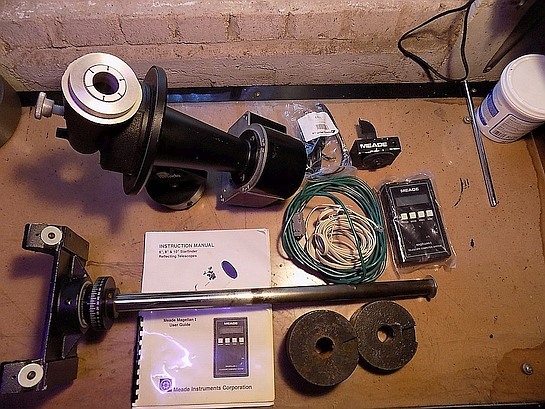 I managed to finish tear down today, and, discovered, it is missing a Nyliner bushing on the declination shaft. Does anyone know of a source to purchase these from, or a suitable equivalent? Also, the nylon declination lock screw has swollen from being out in the elements, is there any way to get it to fit better, or, should I just replace it with a bolt of the same size? You should be able to get both the nylon washers & bolt at a hardware store -- usually in the plumbing aisle. ^.... and the ‘Hard To Find’ drawers in the Hardware section at Lowes. I will probably be emptying some parts out of those "hard to find" drawers before I get done putting this mount back together. This is the closest I've found online for the shaft bushings, and, at their price, I may just order some and try them. 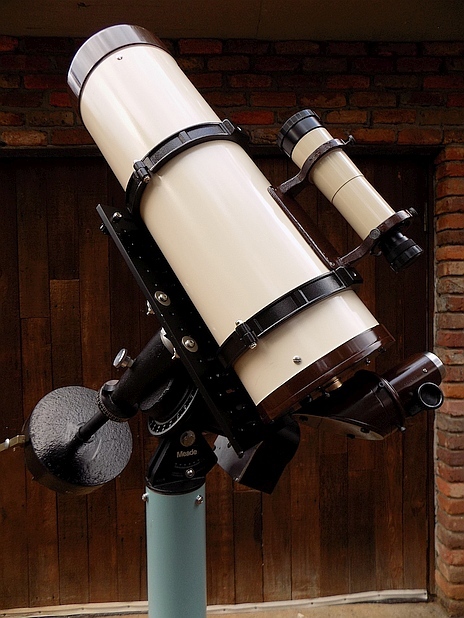 I bought several 1.5" inside diameter flanged nyliner bearing for my Meade 16" Starfinder mount from this website, and they were exactly the correct size, and it really helped me with my mount rebuild. In fact I have three smaller Meade mounts for the 8" and 10" sized scope that I've been wanting to replace these nyliners with nice fresh new ones. So your question got me looking at my "favorites folder" to find them again. If you can manage to get one of the other nyliners out from the mount (there should be two of them--one at the top, and one at the bottom), then use calipers to verify the wall thickness on the bearing and the flange size etc, then you'll be certain. The 1.5" bearings I got were an exact perfect match in all measurments. By Jove -- that's it! Thank you very much for that link, Michael. 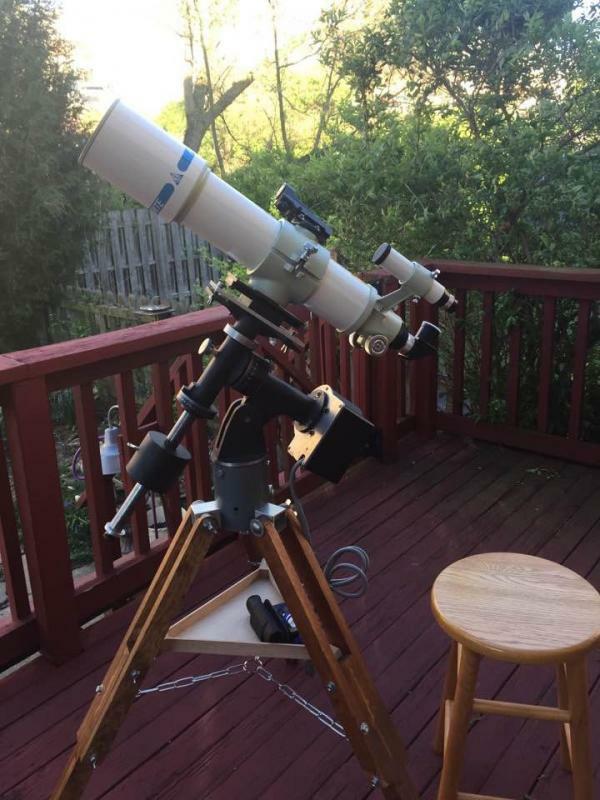 I need a replacement for my 16" Meade Starfinder mount. Now I must decide which of the three to buy. It appears to be exactly like the white one for $5.59. I shall find out in a few days if these are the correct ones, or not. Measurements are all the same. I went ahead and ordered 4, since I've got the mount completely disassembled, and it wasn't easy to break down the declination axis due to the rust on the shaft. When I start putting it back together, should these have lube applied to them? White lithium grease? Once I get the shafts polished back up, I want a light coat of grease or oil, or something to prevent it getting back to it's current state of neglect, but, don't want to apply anything that will attack and degrade the nyliner bushings. 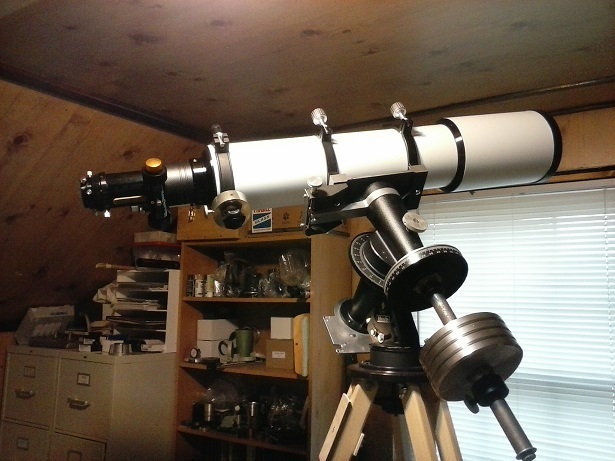 @ astrowolf67, My 16" Starfinder mount is very smooth without lithium grease, which I did buy just in case. The old nyliner bushings did have a thin layer of grease, which were quite old and dirty. So far so good without grease. But I still wonder if there would be a noticeable difference. I have not tried the grease as things feel so nice without it up to now. Edit: the nylon declination bolt is a size that Ace Hardware should carry. I bought a replacement at Ace Hardware. If not them, then McMaster-Carr has it. If necessary you can use a single threaded nylon shaft, and then use the double nut at the top trick to make it as if it were regular bolt. @ Richard O'Niell, Richard, the product number I got was (24L24FK), the white one at $5.59 each, and they are a perfect fit. Look at your original very carefully...it will not look like the 24L24F. On the flange there are the slots that end with a small circular hole next to the center where the shaft is. The 24L24FK has the proper slots with the hole. The 24L24F does not. Edited by michael_m, 07 December 2018 - 01:41 AM. Thank you, Michael. I'd assumed the same but it's helpful to have confirmation. PS. Found a distributor in my area. Oh, happy day! Edited by Richard O'Neill, 07 December 2018 - 12:47 PM. I ordered the nyliner bearings from Applied Industrial Technologies Thursday evening. When I got home from work today, they were setting on the back porch. I can confirm, Thomson Nyliner Bearings, part number 16L16F, are an exact replacement for the nyliner bearings I removed from my mount (Star Finder AC drive w/1" shafts). They are only $1.92 each, but, shipping cost more than the parts did. My total for four, with tax and shipping, was $17.19. astrowolf67, Great ! I'm happy things are working out for you. If you decide to try both non-greased and greased nyliners, please post your thoughts about how the grease feels as far as smooth movement. Good luck. Edited by michael_m, 10 December 2018 - 07:31 PM. I recently took apart my Starfinder mount, and looked for replacement plastic bushings. I am glad you found and ordered those. I had looked to see if I could find similar ones made out of metal. When I had everything apart, I noticed that it was hard to get the bushings out. Mine were held in by two or three little barbs. I think they were made by a punch to score the inside of the housing. When I started to put things back together, I obviously did not get the bushings lined up to those little barbs. But at the time I didn't know it. What I found was that the shafts turned harder. Taking it back apart, I carefully filed down those little barbs. I felt they causing the bushing to be too tight against the shaft. Afterwards, the shafts turned much better. So, I'm not sure if your housing has those little barbs. If your shafts turn harder, that may be the reason. Edit: I cleaned up my old bushings and put them back in. They looked good. I also cleaned up the housing, and removed all the old grease that was there. I first put the bushings in dry, and it just didn't seem to turn smoothly. Took everything back apart and use a little oil. Everything turned much easier. I may take everything apart, one more time, and put some lithium on them and see how they turn. I got a lot of weight on the mount, so I want to eliminate as much friction as possible. Edited by Garyth64, 10 December 2018 - 08:56 PM. I use that red axle grease from AutoZone, and it makes these axes slick! Yes, I'm a fan of these mounts -- especially with the battery-powered drives for portability (all internal, no bags & wires for me to trip on). It weighs in about 20lbs, and I reduced the CW from 4 to 3 so there're about 13½ lbs there. When they talk about payload capacity of mounts, do they mean just the OTA? or are the CWs included? I'm expecting my rebuilt CD, with F & R, to be arriving soon. Edited by Garyth64, 10 December 2018 - 09:59 PM. When they talk about payload capacity of mounts, do they mean just the OTA? In general, they're referring to the cradle weight. Goobers like me who replace the original cradle with a platform have to keep that weight in mind, too. Here’s the earlier version. It’s the Meade model 852 GEM. I have a range of counterweights to fit the 1” diameter dec shaft. It was originally on a pier. This one was modified by Paul Rini; the pier was cut down to a mini-pier and the mount placed on a heavy duty wood tripod. It’s a keeper for sure and will handle a variety of telescopes. I like it a lot. I saw those when I was taking everything apart. At first I thought the bushings were possibly glued in place, then discovered those barbs. I'm thinking they were probably there to keep the bushing from spinning with the shaft. I don't know what the best way to seat new bushings on those barbs would be, other than just giving them time with use. Edited by astrowolf67, 11 December 2018 - 06:05 PM. Wow, I'm starting to drool on myself here! My original plan, was to just strip my 8" Starhopper dob down, and strap it on. Then, on the day of purchase, I was told they also have the OTA somewhere in their warehouse, and they would call if they came across it (I'm hopeful they find it, and, it's in better shape than the mount was). I mentioned to my wife about stripping the Starhopper down, and mounting it, and was quickly told, "no, that wouldn't look right on anything other than the rocker box you built for it". Without skipping a beat, I quickly replied, "I guess that means I'm in the market for another scope then". That was followed by about a half hour of silence, during which I never dared to make eye contact with her. She finally broke the silence, and asked, "what about some of your other's that don't have a mount?" I managed to look to her with a smile, and replied, "they aren't big enough". I'm hopeful they will find the original OTA, however, considering the shape the mount was in, I fully expect it to be a parts donor. If it's mechanically sound, I can replace, or recoat the optics. The steel used in these mounts is of good quality. The rust is easily removed with a grinder mounted wire brush.